The Remote Warfare Programme is organizing a two-day workshop on the past, present, and future of Remote Warfare, starting on the 28th of February. The Royal United Services Institute (RUSI) organized a launch event for its paper on China’s export of drones to the Middle East. Wim Zwijnenburg, project leader at PAX and coordinator of EFAD was present, and wrote a review of both the event and the report. In the US, Dutch Reaper operators are currently training to fly the unarmed Reapers the Netherlands is expected to operate in 2020. The UK is pulling back over half of its military aircraft from the Middle East, but Reaper drones are staying behind, Drone Wars UK reported. UNIDIR has carried out a tabletop exercise, concluding that the international community would benefit from more discussions, transparancy, and norms on the use, transfer, and proliferation of armed drones. 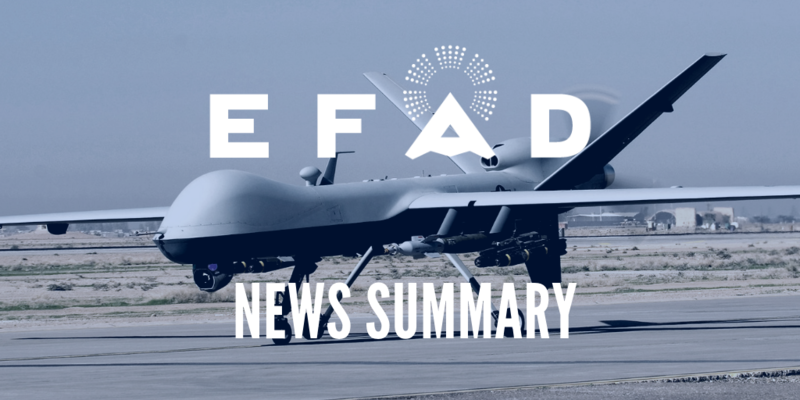 We have published our press review for December, with stories on drones at Gatwick airport, as well as Polish and Czech drone developments. EFAD member Nuhanovic has given an interview on their work providing legal assistance for the victims of drone strikes. Five Belgium companies will be involved in the production and maintance of drones, as well as the dissemination of intelligence they will gather, as part of its Reaper-purchase. Ukraine is buying twelve Bayraktar TB2 drones from Turkey. ECCHR held a conference on the US’ use of Sigonella, an Italian military base, for its drone program, and the associated legal and strategic issues.